It may seem ridiculous to take just seven seconds of action from a match and build a mountain of optimism on it, but that is what I am plucking from Saturday�s 3-1 demolition of Fulham. The action had at its climax the sweetest of goals from Our Harry Kane. Arise Augustus, Emperor of Tottenham, who has now buried that irritating summer burden of never scoring in the eighth month of the year. Aitch might easily have had a hat-trick. Just wait until he gets back to top gear! But it was the creator of the goal � Erik �The Eel� Lamela � who claimed my eye. His galloping fun run through the Fulham defence was, I thought, a bold statement of intent by the man who has been to hell and back. �Reminded me of Gazza,� said no less a man than Tottenham Legend Cliff Jones. Many wrote Lamela off as finished during his 13 month lay-off during which he had two hip operations. In his lowest moments even he must have had self doubts. But his countryman Mauricio Pochettino kept faith with him and rewarded Erik with a new four-year contract, while the ITKs were wrongly selling him off to Italian clubs. 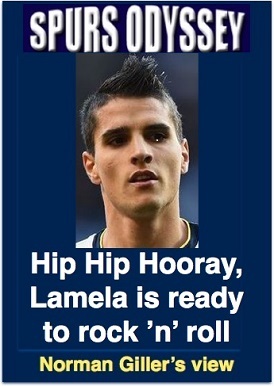 My regular reader (thank you) will know I go back a long way in my admiration of Lamela. I saw him playing for River Plate during a trip to Argentina and I thought he was one of the most exciting teenagers I had ever seen. I came back to London determined to tip off my old mate Harry Redknapp about him, but by the time I stepped off the plane he had been snapped up by Roma. Since his arrival at Spurs he has been cursed by injuries and we have seen only glimpses of his dribbling and scoring ability. Pochettino knows better than any of us about his flair and finesse, and in training sessions with his Tottenham team-mates he is always the one to beat in the skill tests. Let�s hope he proves my reading ability spot-on in the weeks ahead as Tottenham build on the foundation of two positive victories. It will also silence the pessimists who say Spurs do not have strength in depth in their squad. As Lamela, Dembele and Winks came on as substitutes and allowed Pochettino the luxury of changing his formation I warmed to the fact that despite what the dismal Johnnys say Tottenham have a cracking squad. As our guru Paul H. Smith records HERE (without mentioning that it was his birthday! ), a smart goal from Moura and a now trademark free-kick from Trippier set the scene for Our Harry to step back on to the scoring stage. It was a nice birthday present for Mr. Smith and brought much-needed smiles to Spurs faces after the deep depression caused by the delay in the opening of the new ground. All those beating up Daniel Levy & Co should ask themselves if in their line of work they have ever gone over time and missed a deadline. It often happens, particularly in the building trade. Nobody has done it on purpose. It is as it is and you won�t make old bones if you let it cause you concern that you cannot control. In the history of the new stadium it will amount to one cackle from a cockerel. Relax. It will be worth the wait before we enter All Our Tomorrows. COYS! We are under way with the fifth Spurs Odyssey Quiz League. Entries to last week�s first teaser came from far and wide including Tottenham family members across the Pond, also in Cyprus, Austria, Hungary, Israel, over in Hong Kong and Down in Oz, along with all the usual suspects. Nice to have you back on board. Everybody who takes part gets a personalised reply from me, which I believe is fairly unique for this sort of competition. Don�t let that put you off competing for this year�s prizes for the champion: two books from my Spurs collection with autographs from Jimmy Greaves, Steve Perryman and Dave Mackay, and a framed certificate announcing the winner as SOQL champion. There will also be a special bonus prize that I will announce later in the season. I promise it�s a collector�s item for anybody who follows the mighty Spurs. I always ask a two-pronged question with three points at stake. Which Tottenham legend, with the second name Dallas and winner of 28 international caps, ran a printing business throughout most of his playing career and from which club did Bill Nicholson sign him? Please email your answer to me at SOQL2@normangillerbooks.com. Deadline: midnight this Friday. I will respond to all who take part. Last week I asked: Who wore the No 9 Tottenham shirt in an FA Cup winning team, and which Spanish club did he later manage after playing for Las Palmas and Sevilla? Most of you were correct with Vinny Samways, who managed Spanish side San Pedro after winding down his playing career in La Liga. Vinny, Tottenham�s No 9 in the 1991 FA Cup winning team, was a product of the Spurs youth system and was nicknamed �Sideways� because of his style of passing that would be warmly accepted in today�s game! Thank you for taking part. See you back here same time, same place next week. COYS!